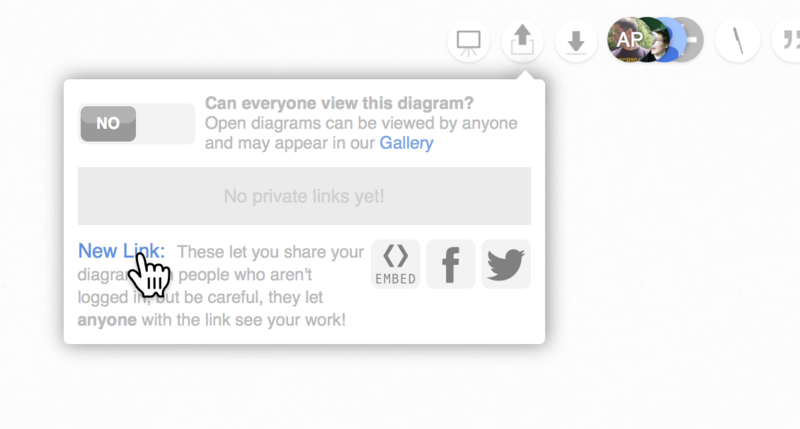 As well as inviting people by email to view or edit your diagrams, you can create special "private links" to diagrams, which allow anyone with that link to view the diagram. Unlike making the diagram public, a private link (also known as a "sharable link") is a secure way of sharing a diagram just with the people you share the link with. You can revoke a private link at any time, and the people with that link will no longer be able to view the diagram. A link will immediately be added to the list of private links. To copy it click on it, then use your browser's [ctrl]+[c] keyboard shortcut for copying, or right click on it and choose the copy option from the context menu. You can share the private link with other people however you like – via email, twitter, Facebook or another social network. When you hover over each link in the list, icons will appear to allow you to delete (revoke) it, and to change whether it allows the people viewing via that link to download and make copies of your diagram. 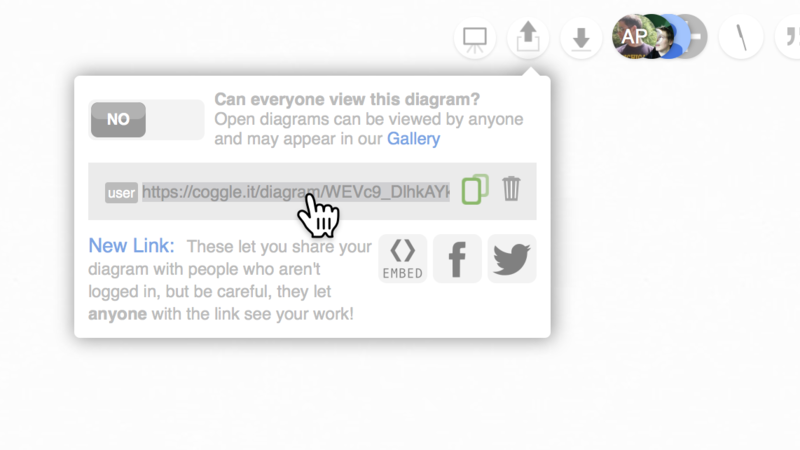 Tip: Private links to diagrams in Coggle organisations (provided the Organisation has External Sharing enabled in its settings), and for people with an Awesome subscription also have an additional icon which can allow people viewing the link to edit the diagram.